For the last several weeks I have been conducting several interviews of the “old time” (said with the utmost respect) Armenian musicians that had a presence in Detroit back from the early fifties and it really continues to be an eye opener. The average time I have spent with these interviewees has been around two hours and I really enjoy the conversations. I find it fascinating to watch them recall the past and dig into their memory banks about the times when they played music. This isn’t an easy task for some of them but you can tell they are recalling better times and what gets me the most is that they still miss playing music and most of all the audiences that danced and enjoyed their music. It is almost like time moved on and forgot about them as they talk about their playing habits, the kind of gigs they had and so forth. What I have discovered throughout the process is that there is a unique bond between all of them. These are not musicians that see each other than much so its not like they all got together and decided what they would tell me during the interviews. There is without a doubt a common threat of how these musicians thought and played with many musicians performing today. Time moves on, but the feelings are the same. Many times I felt that I could identify with how they felt. 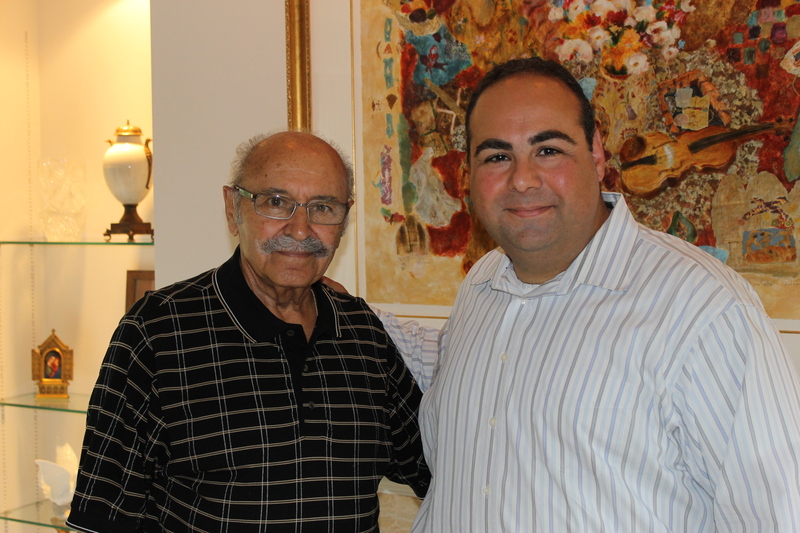 I had the opportunity to talk to Art Melkonian. This was a wonderful interview for me as I was unaware he was still alive. Not only is he alive, but he doesnt live far from me and he still very active. He loves being Armenian and spoke fondly of the “hey day” of Armenian music. I wont give it all away as you will need to see the finished film, but the one thing that stuck with me is the commonality we have when it comes to music. Art played clarinet with the Arax Band and they recorded the Harem Dance (aka Shish Kebab) which because famous around the country on Billboard charts for several weeks (#67 out of 100 in 1957). His work ethic for playing music was simple – play for the people. “They paid good money to hear us play and we were going to give them their moneys worth”. No such things as long breaks for Art and his band, the same holds true today. If you have an audience – they want to dance, so you have to play music. He also talked about how they go gigs, how they rehearsed, etc. I guess hearing these stories shouldn’t amaze me, but they do. As I conduct each interview, I know the work I am doing to preserve their stories and music is so important to both the Detroit Armenian community and our heritage. How awesome Ara, Abris! Too bad you couldn’t get them to play just one more time!